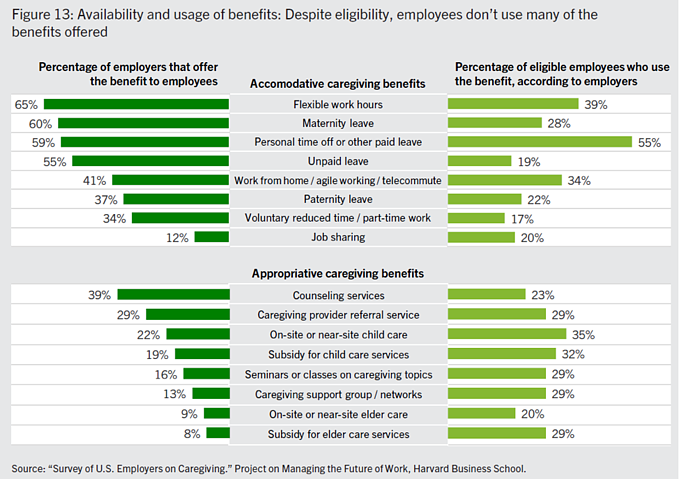 Two researchers from Harvard Business School released a study that suggests employers are largely underestimating a “caregiving crisis” that impacts their bottom line. A caregiver is an employee who regularly looks after a child or a sick, elderly, or disabled person. These employees struggle to balance the responsibilities of work and caregiving, often dealing with the unexpected and recurring care obligations that require mental, physical, and financial resources to address them. With nearly three quarters of U.S. employees bearing some caregiving responsibility, the breadth of the crisis impacts more individuals than other more popular areas of well-being. Employers are underestimating the impact caregiving has on their businesses, as evidenced by 80% of workers with caregiving responsibilities saying the responsibilities of caregiving impacts their productivity while just 24% of employers think caregiving influences performance. Part of the reason most employers underestimate the impact of the caring economy on productivity is that the majority (52%) choose not to measure its impact. Despite the lack of measurement and adequate resources to address the problem, employers do recognize that caregiving obligations impact career trajectories for employees. According to the survey, employers identified unplanned absences and missed days of work (33%), late arrival at work (28%) and early departure from work (17%) as the top three behaviors that undermine career progression. If productivity is not enough of a reason for employees to address the crisis, retention only furthers the case. Below are some statistics that show the cost of caregiving on retention. According to the survey, the unaffordable costs of paid help (53%), the inability to find trustworthy and qualified paid help (44%), and the inability to meet work responsibilities due to the increased caregiving responsibilities (40%) were the most significant factors contributing to employees quitting due to caregiving responsibilities. Fortunately, these are areas where employers can help employees. U.S. firms are facing a caregiving crisis and refuse to acknowledge it. They are oblivious to the growing costs of the care economy and that is hurting them and their employees.